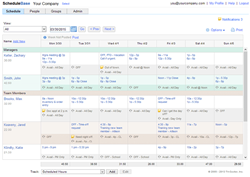 Companies with more than one location can now use ScheduleBase to schedule employees at multiple locations. When schedules are posted, employees will automatically receive a composite schedule view from any schedule where they're scheduled to work and will instantly see where to report to work. ScheduleBase, employee scheduling software that facilitates communication between managers and staff anywhere and anytime, recently added a feature that allows businesses to manage individual schedules for multiple locations, making it easier for businesses to keep track of employees who work at more than one location. Jon Forknell, Vice President & General Manager at Atlas Business Solutions, Inc., the publisher of ScheduleBase, says that with the improved feature, “shared employees and their work schedules are always visible to prevent overtime and blatant schedule conflicts. When schedules are posted, employees will automatically receive a composite schedule view from any schedule where they're scheduled to work and will instantly see where to report to work." ScheduleBase software is developed by Atlas Business Solutions, Inc. This employee scheduling software makes scheduling people and jobs less time-consuming. No more phone calls and no more headaches. The company’s commitment to customers is reflected in its mission statement: "To provide exceptional small business software, customer service and support that will enhance the productivity of our customers."